Encouraged by the performance of running a basic wiki engine on the new Raspberry Pi 3, we can try a more resource intensive service. OwnCloud is a popular web based file-sharing solution, similar to Google drive or Dropbox. Reports of running OwnCloud on the original Raspberry Pi have generally been discouraging for performance reasons. We continue using the same lightweight web server setup from the last tutorial. Although not really recommended, we are using sqlite instead of a server based database, primarily out of simplicity and to minimize the amount of services we need to run within the tight memory constraints of the Raspberry Pi. This is using a self-signed certificate to assert the identity of the server, which most browsers will block with a security warning. This could be avoided by obtaining a certificate from one of the certification authorities trusted by the browser, but such certificates can only be obtained for the identity of a public fully qualified domain name and not for an ad-hoc self defined name in .local. After restarting the server with sudo /etc/init.d/nginx restart. The use the browser to navigate to http://raspberrypi.local/owncloud/ and follow the instructions for database setup (use Sqlite) and creating and admin account. After that, log in as the admin user and use the admin settings in the upper right part of the screen to add new users and continue configuring the server settings. 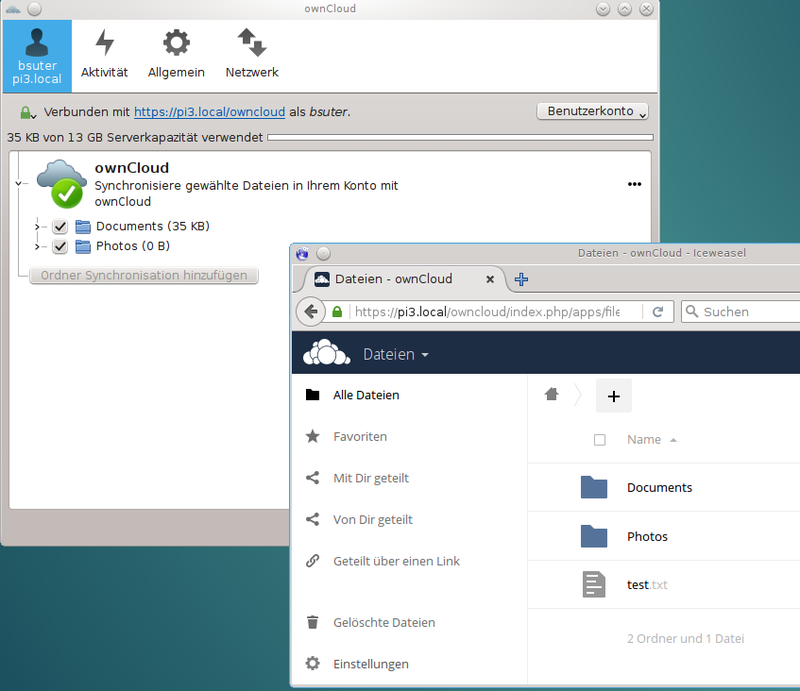 For a single user setup, this very basic installation of ownCloud is surprisingly usable for file sharing for at least a small number of files.